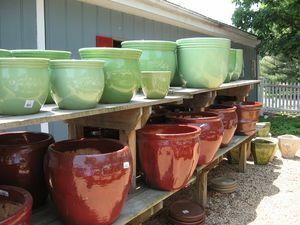 You will find a wide selection of clay and glazed pots, planters and baskets in various sizes, shapes and colors. 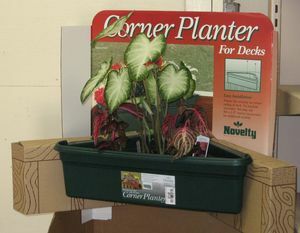 We also offer a variety of window boxes, as well as pavers and stepping stones for your lawn and garden. In addition to their attractiveness (especially as they age over time), terracotta pots offer several benefits to the plants they house. Made of natural clay that is porous, these pots make it hard to overwater plants. Terracotta allows plant roots to breathe and clay offers excellent heat retention and repellent properties. To keep your pots looking good and lasting for years, they need to be properly cared for. Since terracotta pots are porous, it is important to clean them to prevent fungus and algae. Winterizing them is important, as well. 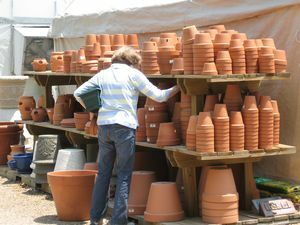 After they are cleaned and completely dried, store them away from the elements either upside-down or stacked with something between each pot so they don’t stick together. Bake terracotta pots in your oven at no more than 220 degrees farenheit for an hour. After oven is turned off, let pots stay in it and slowly cool so they don’t crack. You can also clean with a 1:10 ratio of household bleach to water. Submerge pots completely and then let dry in open air until bleach dissipates (usually 2 days). Bleach can eventually erode the clay, so you may not want to use this method every time. Or, you can use white vinegar instead of bleach, following the instructions above. This method also works in a dishwasher using the highest heat and the most scrubbing sprays possible. Add white vinegar (or bleach solution) and run it through a cycle. Air dry pots for a couple days. To remove hard water or salt deposits on clay pots, scrub them with a paste of baking soda and water. You can also use fine steel wool. TIP: Before using a new clay pot, soak it in water so that the pores will swell and help prevent future moisture from leeching out of the soil. Or, ask us about a "spray and seal" for your clay planters, which will also help prevent moisture from escaping the soil. Terracota pots get more beautiful and unique looking as they age. 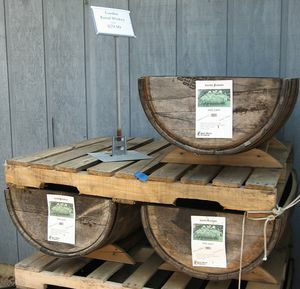 But, rather than wait years for that process, how about giving them some help to speed up the aging or antique effect. Below are a few links that will show you how.